Let’s take a look back to 1962 … this edited report, which appeared in the Kingaroy Herald-News that year reflects on an even earlier time and the pioneers of the South Burnett peanut industry. January 25, 1962: Memerambi’s Ben and Harry Young have more than one “first” to their credit! They were among the first commercial peanut farmers in the South Burnett. Ben designed Kingaroy’s first pick-up thresher (a bean pick-up which then threshed the peanuts in a converted grain header) and was a long-time Peanut Marketing Board member from when he was elected in 1935. His brother Harry build the area’s first peanut deshelling machine. Ben began peanut farming in 1919 in partnership with Harry. They started with only five acres of Spanish and 20 bags was a “pretty good” crop. They found their own markets and had to hand-shell all nuts. When things got better they began to think along time-and-labour-saving lines and Harry came up with their own de-shelling machine. Hand threshing was out for Ben and Harry after they built their own thresher. The first machine to hit the market in Kingaroy was of a similar design to their Old Faithful. The original machine could manage 20 bags an hour. 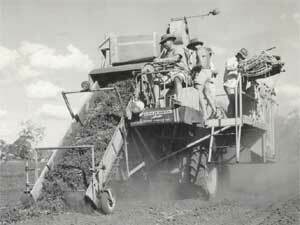 Today (1962) the threshers are capable of 80 bags an hour. Harry has retired and lives at Torquay but Ben continues farming, although husky son Les relieves him of the hard work. His peanut crop is now 80 acres and these with other crops and 350 pigs keep the hours crowded. NB: This report was updated in June 2003 with information supplied by Harry Young’s son Wilf. Pioneers Harry and Ben Young are both deceased but the peanut farming family tradition lives on at Wooroolin with Ben’s son Les and grandson Mark.